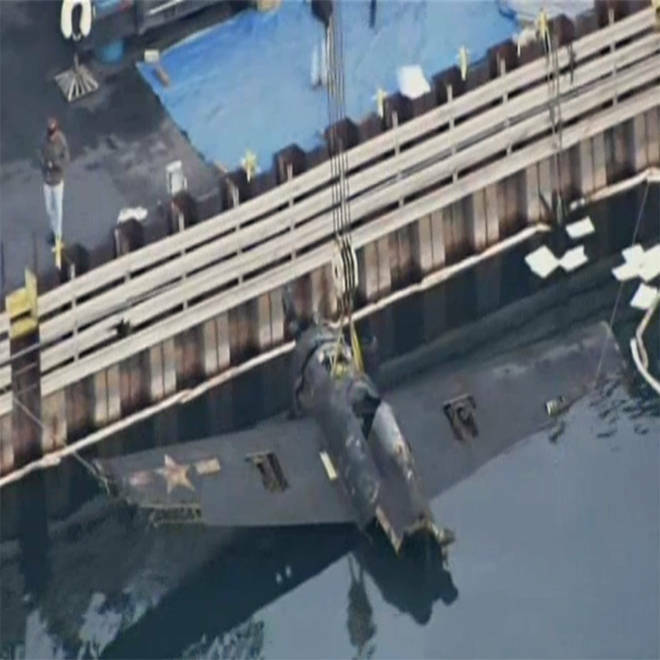 On Dec. 28, 1944, a FM-2 "Wildcat" Fighter aircraft crashed and sank during a training mission in Waukegan Harbor, NBCChicago.com reported. Engine failure was blamed, and the plane was left in about 200 feet of water, according to NBCChicago.com. Friday's recovery, which had an audience of nearly 100, was the first milestone toward getting the plane restored and eventually in a museum, the Chicago Tribune reported. A 78-year-old pilot from Mettawa, Ill. paid for the recovery, according to the newspaper. "It’s a pretty inspiring thing," pilot Charles Greenhill told the Tribune. "You think you get used to it, but you don’t." The plane is expected to be transported to Greenhill's Kenosha, Wis., hangar and then to Pensacola, Fla., where it'll undergo a full restoration -- which could take at least five years -- at the National Museum of Naval Aviation, the Tribune reported. It's hoped that the plane will permanently reside in a proposed museum on the former Naval Air Station Glenview site in Illinois, according to the newspaper. Crews remove a FM-2 "Wildcat" Fighter aircraft on Friday that crashed during a training mission on Dec. 28, 1944, in Waukegan Harbor. The "Wildcat" aircraft was one of the planes used to train Navy pilots during World War II, and they'd practice flying from the naval air station and from aircraft carriers, the Daily Herald in suburban Chicago reported. During the war, over 17,000 pilots trained over Lake Michigan, according to Rockford, Ill. NBC affiliate WREX. "This thing would've been a piece of junk,” Greenhill told the Daily Herald. "Instead, it will become a piece of history that people will be able to see and appreciate." The recovery happened on a day of related significance: Friday was the 71st anniversary of the attack on Pearl Harbor, which claimed thousands of lives and launched the United States into World War II, according to The Associated Press.